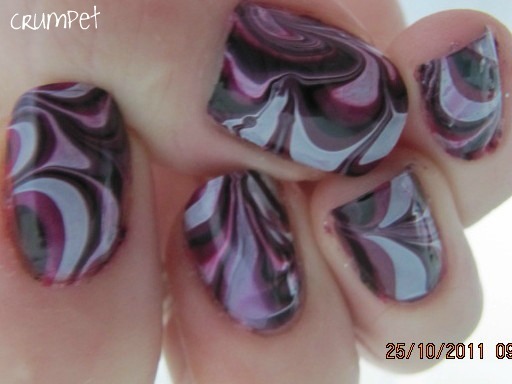 I wanted to do a water marble for Hallowe’en and knew what I wanted to do. 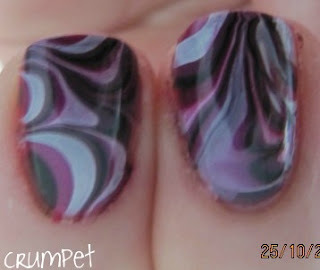 As so often with water marbles, this isn’t EXACTLY what I had in mind lol, but it still works in my head. My aim was for a black base with a dark pink and dark purple stripe in it, and a very thin white or silver one. I wanted to create a really nocturnal flower design. In my head, I kept seeing Morticia Addams lopping those rose buds off the stems, so I wanted something dark and twisted enough that she would wear it. 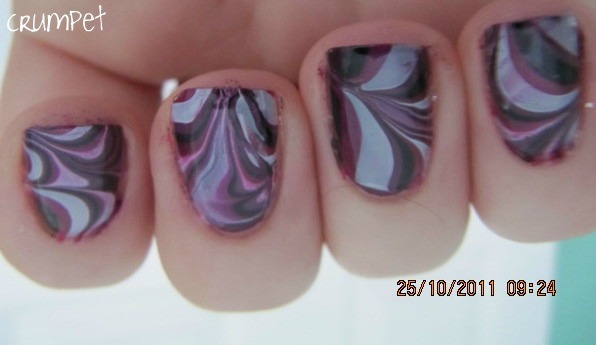 This went wrong / right in my choice of base colour – Zoya’s Lael. 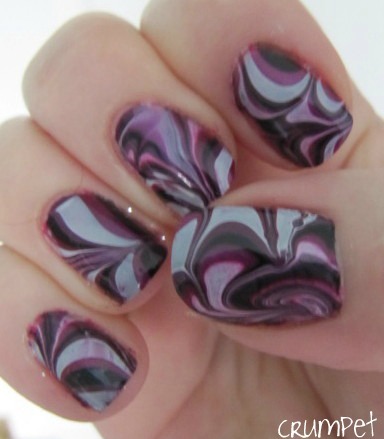 I chose a dark purple because it has going to feature heavily in my pattern and I didn’t want to use a black base. What I didn’t factor in was that the darkness of the base would make the white in the marble go so murky …..however, this does give it quite a “dead flesh” feel, so I can live with that mistake. My 4 marbling colours were Zoya Demi (a mid purple), Sally Hansen Hot Magenta (a medium bright pink), SH White On and SH Black Out. 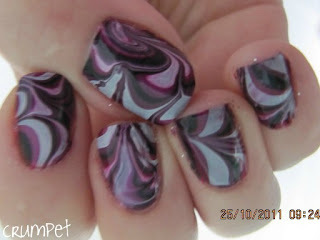 I really feel this ended up EXACTLY like the sort of water marble a witch would wear! It’s dark, it’s depressing – it sure didn’t make me happy to wear. It’s so ugly, it’s almost perfect for Hallowe’en. I do like how the colours swirled together in such dark harmony, and from some angles, there’s a lot of blackcurrants and cream going on! Lol … nearing the end of the Hallowe’en posts now. Just a couple more to go – another Franken (the one that made me happy to sacrifice CG Crystal Ball), China Glaze It’s Alive, CG Mummy May I, purple witch’s tights (my fave) and a secret water marble to end it all on Monday. And then, prepare yourselves for some FIREWORKS!!!!!!!! !